Apple today updated its Apple Store app for iOS devices with support for Siri Shortcuts, an iOS 12 feature. 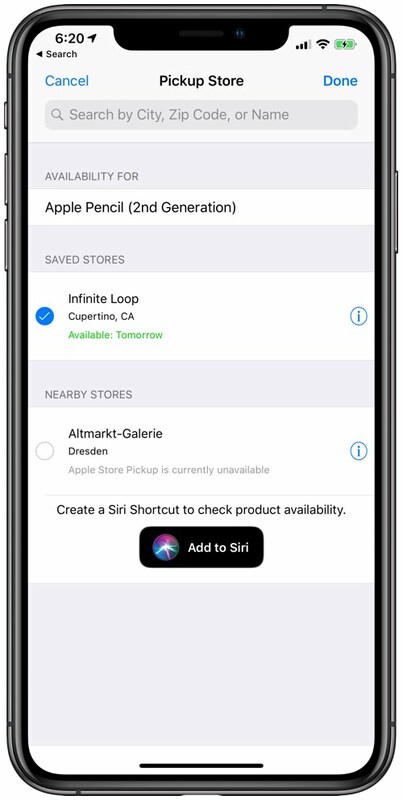 Siri Shortcuts for the Apple Store app can be used to create custom voice commands to check product availability or the status of a recent order you've placed. When checking the "My Orders" page, there's an "Add to Siri" button that lets you check order status. Similarly, when viewing the in-store pickup options for an item, you can use the "Add to Siri" button to create a custom Siri Shortcut. According to Apple's Apple Store app release notes, the update also brings delivery support for locations throughout Puerto Rico. - With Siri Shortcuts, you can create custom voice commands to check product availability or the status of your recent order, without having to open the app. - The addition of new iOS 12 features and capabilities make the app even easier to use. - Delivery now available to locations throughout Puerto Rico. Wait, what? After Apple failed to make Siri more intelligent, they came up with the idea to let users create their own Siri phrases and shortcuts. And now you can create your own phrase to check availability of Apple products in their stores??? Do they realise how stupid this is? It’s 2018! If I ask Siri whether the latest iPhone is available in the nearest Apple Store, she should know the answer without me having to first program Siri to understand me. I’m not saying I dislike Shortcuts, it has its purpose for pro users wanting more complex routines, but this is ridiculous. It’s the responsibility of Apple, not its users, to improve Siri.